What she lacks in stature she makes up for in heart, the small but gutsy Magnicity showing plenty of tenacity when saluting at Moonee Valley on Friday evening. 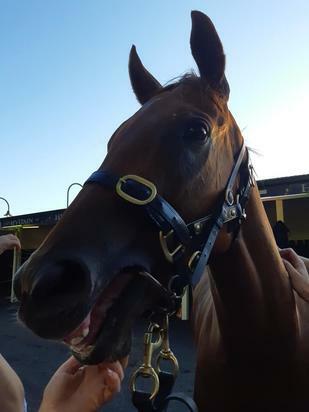 Having her first run since finishing close up in Group 3 company at Flemington on Melbourne Cup Day, the attractive chestnut was having just her third start but she raced with the professionalism of an experienced veteran. It is never easy to bring the field up to a tearaway leader but that is just what Magnicity did, as jockey Jye McNeil reported "she did a very good job chasing a really strong speed." "She toughed it out really well to the line," he said, adding that the experience she gained from her first couple of starts over the spring held her in good stead - "that was definitely an asset." "She is still pretty small but she is a bit stronger this time in. Mentally she has always been a great minded horse, very good natured and that is a key to her." "She had a little gawk at the leader but once we got beside it we were right." Part owner Bryan Martin was part of a big group on course to celebrate and he had been looking forward to the race all week having seen her work on Monday morning - "she was sharp in her gallop, I thought we were a great each-way chance." "Robbie has done a great job with her," he added, describing Magnicity as "a real little pro. She is not very big but she has got a great ticker." Bryan took time to pay tribute to one of his syndicate members John Cleland who passed away during the week - "he has been with us since day dot," he said of the well liked bookmakers clerk who was part of the great Fields Omagh ride, "and I am sure he was helping give Magnicity a kick into the straight." An Inglis Classic Yearling Sale graduate by one of the stable's favourite sires Magnus, Magnicity is out of the four times winning city placed Exceed And Excel mare A City Girl. Served last spring by Toronado, A City Girl is a daughter of the triple stakes winner Lady Knockout, in turn daughter of the three times Group winner Prime Again. She is a descendant of the famed matriarch Eulogy.